From Gold, to Paper, to Silver! Between 1863 and 1933, the U.S. Treasury released gold certificates as a form of paper currency, each giving its holder title to the corresponding amount of gold coin. The original $500 note is the highest denomination U.S. currency note to feature Lincoln, and even in low grades they can fetch thousands of dollars at auction! 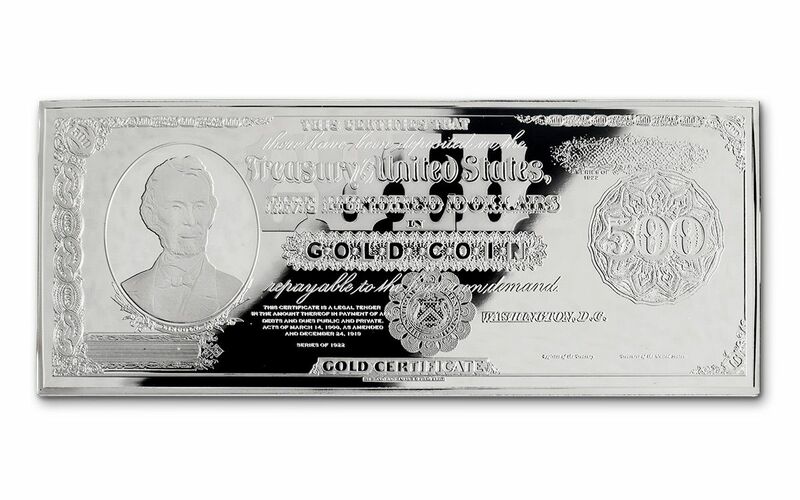 Now, exclusively through GovMint.com, you can add your very own 1922 $500 gold certificate to your collection -- struck in four ounces of 99.9% pure silver! Each is struck in shimmering Gem Proof condition and comes in a protective capsule, housed in a beautiful wooden presentation case. Order now!